Step 1. Go to: Fedex Developer Resource Center and create developer’s account. Step 2. When you create developer’s account go to Developer Resource Center and click on top navigation FedeEx Web Services -> FedeEx Web Services for Shipping. Now, you will see the link Develop & Test Your Application (about testing, obtain developer test key) click on it. Then you only have to send request for test environment, you can see the link “Obtain Developer Test Key” click on it and fill the form. After sending form with data, you will receive email message from FedEx with all required data for testing FedEx shipping method. 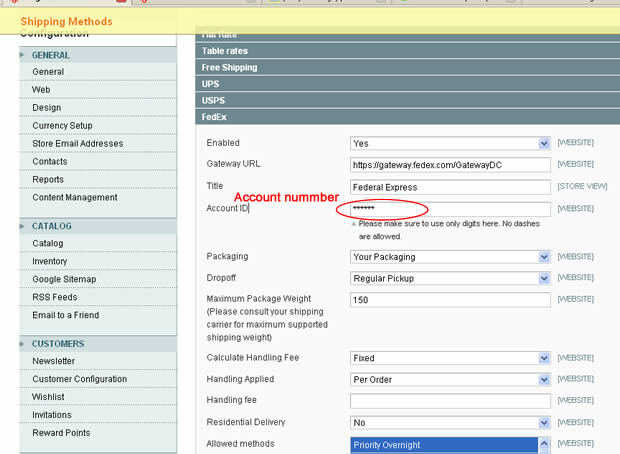 In this email message you will get: Test Account Number:xxxxxxxxx (for FedEx Web Services for Shipping only) and you have to insert this number in field Account ID in FedEx config section, take a look at below image. After you’ve successfully tested your application and are ready to go into production, go to the FedEx Developer Resource Center to obtain your Production key. My FedEx Rate API working and showing rate to the customer. In the part creating a shipping label, I am getting an error like “Authentication Failed”. How can i create FedEx Shipping API? Note: My FedEx Rate API Working Good. “shipping label has been created. the status will be updated when shipment begins to travel” status. Even though shipment date expires status not changed and Shipment not created… Why?? The site is linked to our FedEx account. Up to about 5 or 6 boxes… FedEx results are correct to the Penny. FedEx Tech Support claim they can see the multiweight results being calculated in the back-end, but Magento is displaying something completely different (mostly too high) on the front-end. Anyone can recommend a solution? How can i solve the configuration Process. My magento Fedex control panel completely different, lokk like : https://snag.gy/Ur28DB.jpg how can i solve the error. 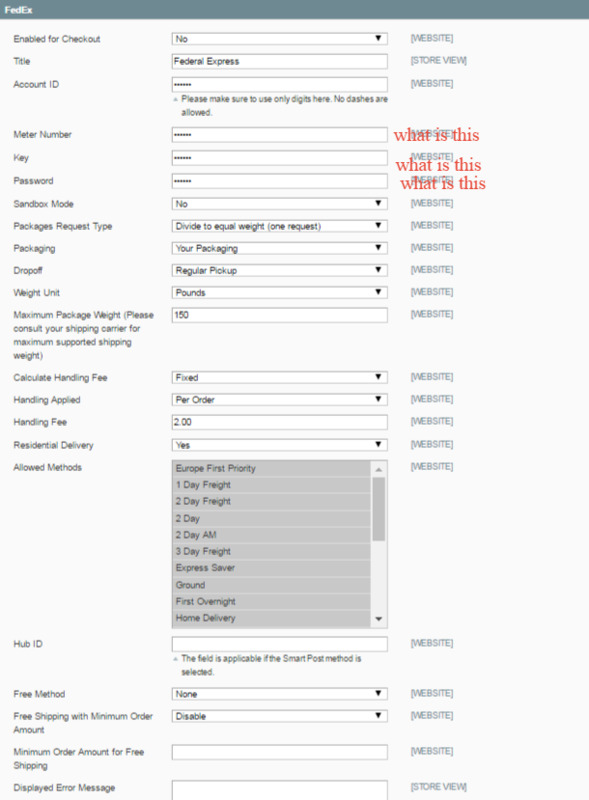 so how can i create shipping label from magento admin panel? 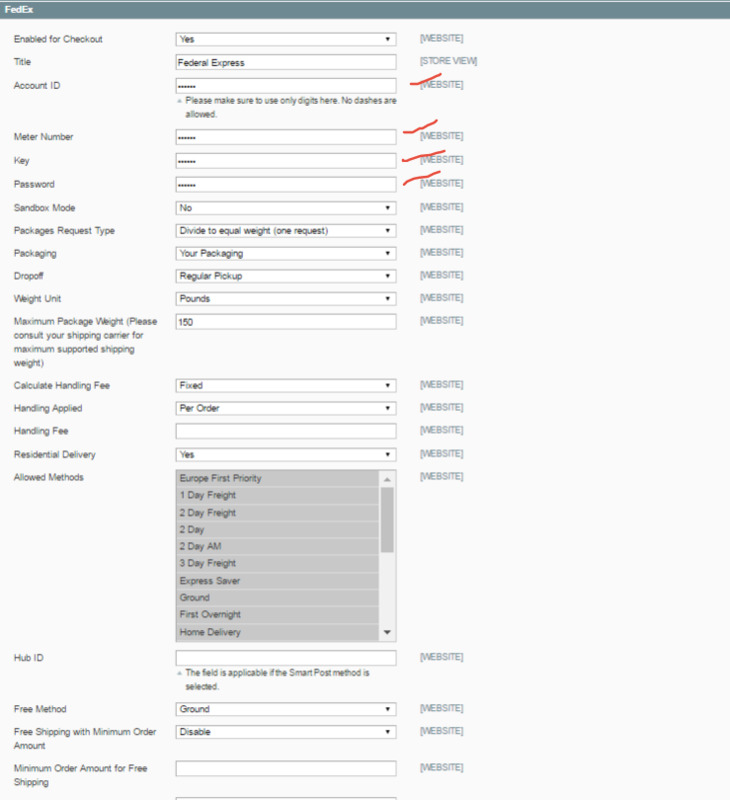 hi i have integrate fedex shipping in magento ver 1.9.1.0 , But when i ship the order from admin panel “create shipping label” check box not showing me. [Message] => The PurposeOfShipmentType is null, empty or invalid. [LocalizedMessage] => The PurposeOfShipmentType is null, empty or invalid.”. Hi Bro, Is it solve your problem ? did you solved this issue ? I am also getting same issue. 2. apend Carrier.php file at line no 410. But if I add this code, then while adding products in shipment it shows ‘Customs Clearance Detail is required’ error, what should be done to this? Please reply asap. Hii, I have doubts in setup of shipping rate ..How do we set shipping rate?? You are expecting shipping rates to come from Fedex right? In which form FedEx and other shipping methods return Shipping label? In html form, Image, some string or pdf? I got the response for shipping label request in HTML from my custom shipping carrier. What should I do to proceed. I want to integrate FedEx shipping method in magento website for Domestic India. So please let me know what steps i will have to follow. Have you received any information about plug in , we are also facing same issue for our India website let me know you if you have any solution . Hi did you get any extension from magento . Please also help me . I am facing same issue with india . Please assist me if you can . Our extension supports all countries and all versions of Magento. ** New – When printing shipping labels you can specify your shipping origin and schedule for FedEx pickups. Upgraded to use latest FedEx webservices API, and offer custom add-ons to meet your exact business requirements. I can able to retrieve FedEx Shipping Method only when user logged in, For new User i can not able to get Shipping Method. FED EX rates are using the Discount rates provided by Fed instead of the Published rates show on the FED EX web site. Once we have integrated withour Magento Web site I do not see and selection that asks if we want to use Discount rates or published rates? Is by design, if so then i would have to request a standard type of account from FED EX so that it would use the published rates? Unless you have some other type of solution? I have al ready an account with Fedex , have all about my account but i do not know how to. Even my collegue who is a web develo^pper said to me , he do not know where to put the code in magento. Hi, I am new to Magento. I followed the above steps, created account on Fedex developer section and added appropriate details in my Magento admin panel. After that what i need to do? Is it required further any third party extension to work. How to generate the quotes? And where i can the status of the shipping? Please tell the whole integration process. This shipping method is currently unavailable. If you would like to ship using this shipping method, please contact us. “. Please, if any one can help me out in this issue. Hi Ravi, Are you able to integrate Fedex in your Magento site? Please reply me the steps and whole process. Thank you in advance. A couple of questions… Does that extension offer Hold at Location? Does it offer Returns? Does it use the latest V4 Address Validation WSDL? I am using FEDEX for my country INDIA but when I add all credentials and test the order it is showing Sorry, no quotes are available for this order at this time. What is the issue behind this? Let me know you issue is resolved or not ,we are facing same issue ,please share the detail if you successfully done it . This method works in other countries besides the USA? When your fedex is not visible on magento frontend. Please check your account details on admin side.